You may be asking what a birra is. I did. In fact I had to Google it to find out what a birra is and it turns out it's just a recipe containing beer. So it definitely sounds much fancier than it is. What we have here is a sort of sausage stew. 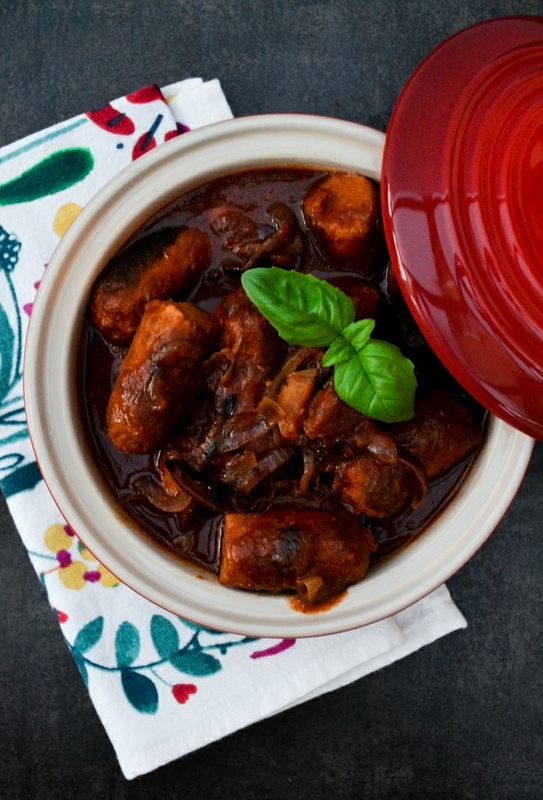 The sausages and onions are slow cooked in a spicy tomato beer sauce. It's actually really tasty. I took a quick photo of it as you can see, before I lost the light. It gets dark so quickly at this time of year, doesn't it? It's the bane of food bloggers lives. Photos taken in artificial light are just awful (unless you have a properly equipped photography studio with expensive lights), so we always take our photos in daylight and there's just not enough of it in Scotland in November. Once I'd finished taking my photos I popped the birra back in the slow cooker to keep warm while I cooked some potatoes and peas. Well I say potatoes and peas, but I was too busy looking at my photos and left Graham to see to the potatoes. I totally forgot to remind him about the peas, so we just ate this sausage stew with mash. It was still comforting and very tasty, even without the veg. This recipe was adapted from a recipe created by Chef Neil Rankin for Crock-Pot. The original was made with lamb and to my mind had way too much liquid in it for a slow cooker recipe. I decided to make mine with veggie sausages and red onion and I also cut the quantity of liquids down, crumbling a stock cube into the mixture instead of adding hot stock. I left out the cloves and lime from the original recipe, which I wasn't keen on adding and I have to say I was really pleased with the flavour. It was a blessing that I didn't add that extra stock the original recipe called for or it would have been more like a runny soup. It had plenty of sauce with my tweaked recipe. I created this recipe in my crock-pot. It's so good for throwing ingredients in and walking away. For this recipe I fried the onions until soft and the sausages until brown before adding the other ingredients to the slow cooker. The slow cooker I'm using these days is from the original Crock-Pot brand which has an aluminium inner pot which you can start off cooking in directly on the hob. My crock-pot is super light and has three settings. Low, high and a keep warm function. I have the 4.5L DuraCeramic Crock-Pot Slow Cooker which is big enough for a family of four, although sometime the recipes do stretch to six. The multi-purpose aluminium pot can be used on all hob types. It's easy to clean and free from PFOA and PTFE non-stick chemicals. Crock-pot is the original slow cooker. 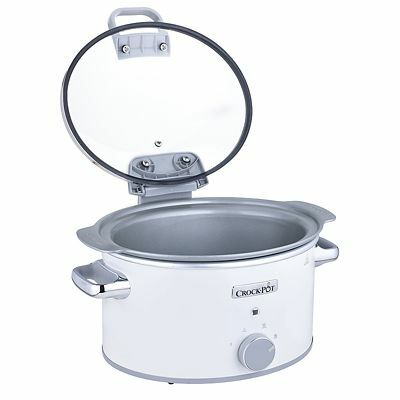 Launched in North America in 1971 and is the leading slow cooker brand. 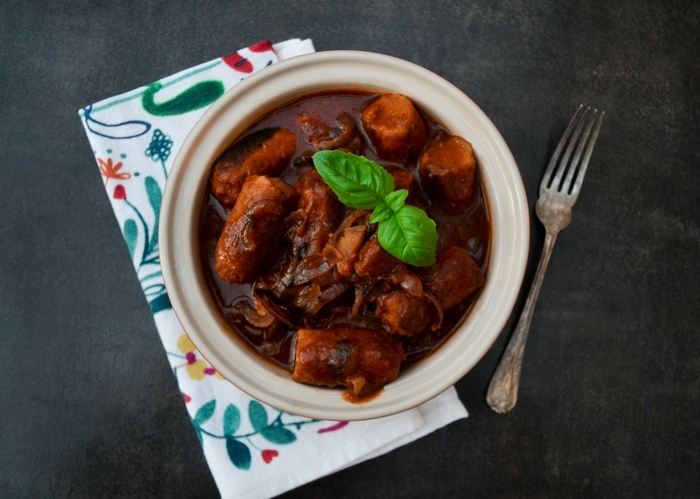 A slow cooked veggie sausage stew cooked in the slow cooker with a spicy tomato and beer sauce. Serve with mashed potatoes and vegetables for an excellent Sunday dinner. Saute the onion in 1 tbsp of olive oil until soft, then set aside. Cook the sausages in 1 tbsp of oil until brown, turning frequently. Add the sausages and onions to the slow cooker then add all the other ingredients and stir. 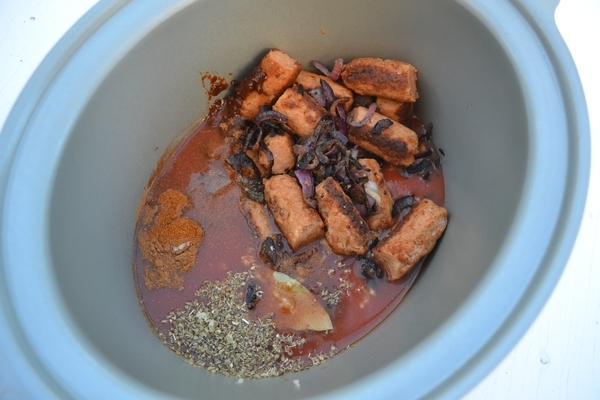 Set your slow cooker to high and cook for 2-3 hours or set it to low for 4-6 hours. If you don't have a slow cooker cook the same way until the sauce has reduced and thickened. Serve with mashed potatoes and steamed vegetables. 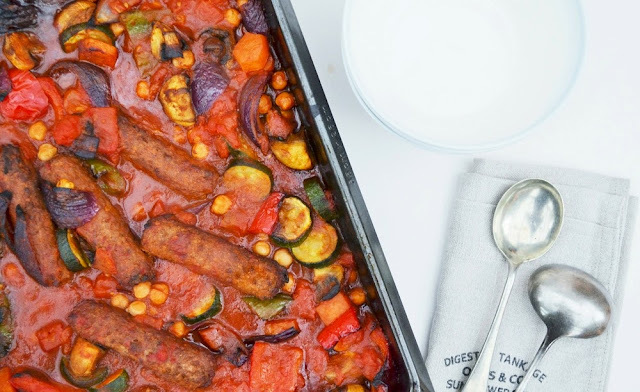 If you liked this recipe, try my roast vegetable, veggie sausage and chickpea bake? Note: For the purpose of display (and looking bonnie) I photographed my birra in a small casserole dish, but my dish was cooked in my slow cooker. Disclosure: I developed this recipe for Crock-Pot UK. I was not required to write a positive review and any opinions are my own. It's a nightmare, isn't it. I end up waiting until my days off but I end up not posting as many recipes as I'd like. This looks super-tasty Jac - my kind of supper! I don't have a slow-cooker but getting the right amount of liquid has always struck me as being the most difficult aspect of using one. Such a handy way of cooking for all the family, I really should get one! Yes that is always the tricky part. It need so much less than a casserole made on the cooker top would. It doesn't really thicken as much either. This was super tasty though. I was really pleased with it. Ooh this sounds tasty. Beer adds so much flavour to things like this! Love a good slow cooker stew. Yes, I often forget about adding beer to dishes like stews. I'll definitely have to try more dishes like this. Yes definitely time to brush off that slow cooker. They really come into their own in the winter months. We are all learning together Ceri and yes the lack of light is hellish, especially if you have a day job too. Ah you are ahead of me there Laura, but I'll definitely be trying it in the future. Oh yes it was super tasty Nadia and very comforting. Ha, for once, as an Italian, I'm ahead of the game here (birra is Italian for beer)! LOL! Haha, excellent Nic and yes a sausage stew is great family food. It goes down a treat. I can imagine the problems you had with too much sun actually, I sometimes have that too in the summer. You won't have that problem now you are moving back to the UK. Welcome to short dark days. Birra is also in slang "beer" in Argentina. :) Laura. Ah thanks for the heads up. You really do learn something new every day. This is my first time to your blog! LOVING it! mind if I link up!? ALways looking for veggie buddies and blogs! Hi Jennifer, thanks for stopping by. These are sooo good. Very nostalgic and looks delicious! i made it with field roast chipotle sausages, a couple of chipotle peppers in adobo sauce from a can (tin), poblano pepper, 3 carrots, one stalk celery, yellow and red onion (didn't have enough red), and 4 cups of chopped kale - plus a touch of maple syrup because the beer was bitter, some braggs aminos because i didn't have any veg bouillon, and some lemon juice to finish off - and fresh cilantro (coriander). came out terrific! Good for you adapting it to what you had. I am so glad it was such a success and you enjoyed it. Thanks for stopping by to let me know. This is good. Best eat with rice then can eat more of it.